Railwayman, MLA (1946-1949), MLA (1950-1953). Born on a farm in the Annapolis Valley of Nova Scotia in 1895, he served overseas in the First World War for 4 1/2 years, being severely wounded and spending several months in hospital before being discharged. Employed with Canadian National Railways. Member of the Norwood-St. Boniface Branch Canadian Legion, B.E.S.L., Brotherhood of Railroad Trainmen. Alderman for the City of St. Boniface from 1931 to 1945. Former Provincial Chairman Manitoba CCF and member of the Provincial Executive. Candidate for St. Boniface in the 1930 and 1935 federal general elections but was defeated each time. He was a Co-operative Commonwealth Federation candidate for St. Boniface in the 1941 provincial general election but was defeated. First elected to the Manitoba Legislature at the 1945 general election, in 1948 he succeeded S. J. Farmer as leader of the Manitoba CCF Party, relinquishing the position three years later to Lloyd Stinson. 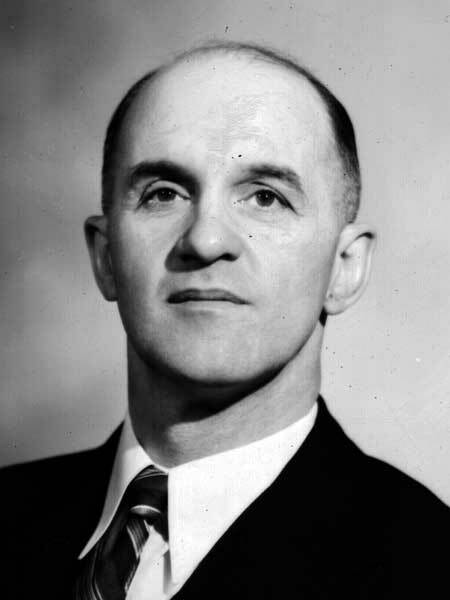 Re-elected provincially in 1949, he was elected Mayor of St. Boniface in 1953, replacing George C. MacLean. He died at Winnipeg on 12 March 1959. “Former CCF leader, St. Boniface mayor, E. A. Hansford dies,” Winnipeg Free Press, 12 March 1959, page 9.